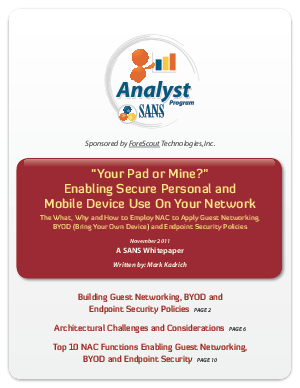 The what, why and how to employ NAC to apply guest networking, BYOD (Bring Your Own Device) and endpoint security policies. Many of today's endpoints are neither known nor protected. According to Gartner, enterprises are only aware of 80 percent of the devices on their network. Those 20 percent of unknown devices are inside the perimeter of the network, are unmanaged and provide users with access. They are small, varied and highly mobile, and they are loaded with their own applications, can act as WAPs, and often contain outdated firmware or are jailbroken. Even as the devices are accessing personal applications on the web, they are also accessing corporate resources such as e-mail-all from the very same unmanaged devices, which have not been vetted by the security organization. Smartphones, notebooks, netbooks, iPads, e-readers, gaming consoles and more-the list of personal devices attempting access to employer networks seems to grow every day in what's come to be known as the BYOD (Bring Your Own Device) era in networking.